I Slipped on A Wet Floor – Is It Really My Fault? Home » Blog » I Slipped on A Wet Floor – Is It Really My Fault? Slipping and falling on a wet floor is mortifying enough on its own, but claims that you are solely at fault just add insult to injury. You do not have to believe this rhetoric, as there is a way to accurately determine fault for accidental slip and fall cases. By examining the incident in detail, it is possible to determine if the property owner is liable for your injuries, or if shared fault comes into play. 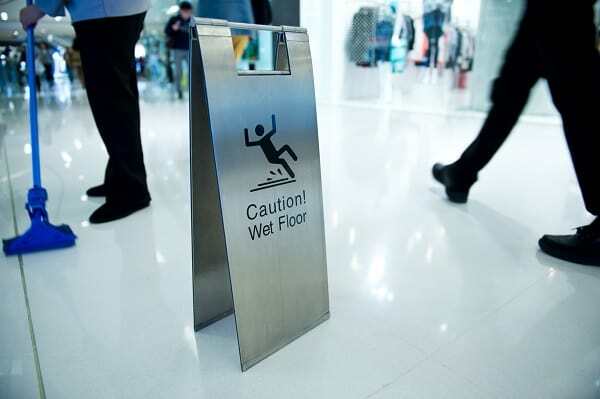 Here’s what you need to know about assigning fault after slipping and falling on a wet floor. While assigning fault for a slip and fall accident, you must objectively determine if the property owner could have prevented the incident. Property owners must take the proper steps to help ensure their building and land lacks dangerous elements that could cause visitors to slip and fall. Areas left in a state of serious disrepair, such as a leaking roof, for example, may reflect a lack of due diligence by the property owner. In addition to proving the property featured a dangerous element that led to the slip and fall incident, it is necessary to show that the property owner was, or should have been, aware of the problem. During your slip and fall case, you must not only show that the situation was present before you fell, but also that the property owner failed to rectify the problem in a timely matter. Daily cleaning and monitoring routines of the property owner will come into question while determining due diligence. Since the property owner’s attorney will attempt to place blame on your shoulders, you must identify any, and all, ways you may have contributed to the accident. If the courts find that you share blame for the incident occurring, your compensation package may decrease by the percentage of fault identified. Your reason for visiting the property, level of caution employed, barriers or warning signs in place around the incident location, and activities leading to the fall will all come under fire while assigning fault. Obtaining legal representation will give you the best chance to correctly assign blame and seek compensation for your slip and fall injuries. To discuss your case with a qualified attorney, contact the team at online contact form or calling 972-793-8989. Our team will help you fight for compensation to cover your pain and suffering, lost wages, and medical bills relating to your slip and fall incident. The Dashner Law Firm, PLLC is a personal injury law firm dedicated to the representation of victims and their families who have been injured or killed by someone else's negligence.